If you work downtown and travel Perry Street on a daily basis, you probably have never even noticed the neat pieces of Montgomery’s rich architectural history located on the west side of that street. Four two story Victorian style houses stand together facing busy one way South Perry Street. These four houses, known as the “Four Sisters’ Houses” were built in post-war Montgomery by Dr. William Owen Baldwin. Dr. Baldwin lived on the southwest corner of South Perry and Adams streets in a fine brick mansion which was the last house to be built before the Civil War. In 1872, Dr. Baldwin engaged James Hale to design and build five houses for his children. James Hale, a former slave of Dr. Baldwin, had been freed before the Civil War. Hale had travelled to Tennessee and brought the body of Dr. Baldwin’s eldest After the war, Dr. Baldwin had helped Hale become an independent carpenter, contractor and designer. These four houses, which face Knox Hall across the street, were built for Dr. Baldwin’s daughters. In the fall of 1880, these houses were deeded to the daughters: address number 402 to Mary Baldwin Williams, 410 to Jennie Baldwin Craik, 416 to Cecile Baldwin Maxwell and 420 to Alma Baldwin Bolton. The fifth house, which faced Scott Street, was built for Marion August Baldwin, one of the four Baldwin sons but was destroyed by fire decades ago. 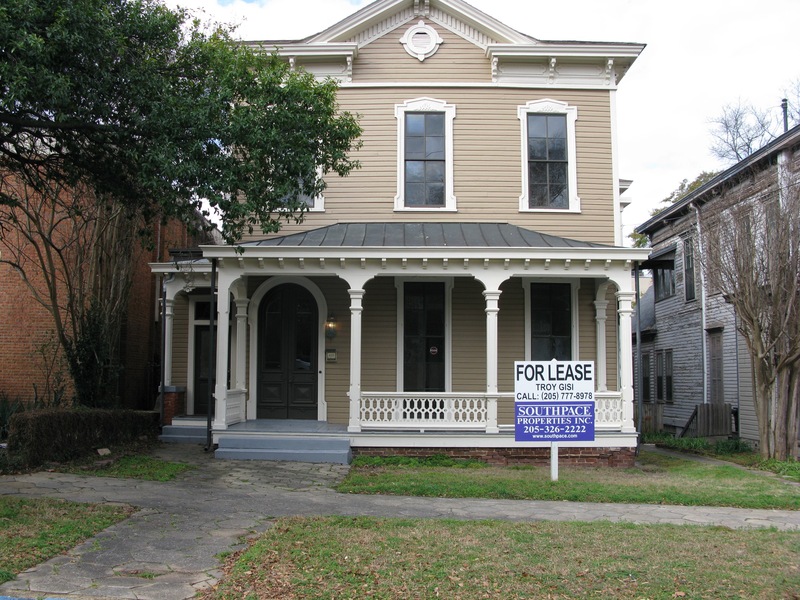 The next Landmarks Foundation Renovator’s event on Thursday, March 29, will be held at the “Alma Baldwin Bolton House” at 420 South Perry Street in the southern-most of the “Four Sisters’ Houses. Alma did not actually live in the house her father gave her. The classic Victorian house with late Italianate influences is in the process of being renovated by Mark Gisi. The house is three bays (openings or windows) wide with a wide porch with elaborate ornamentation and a sort of pediment surmounting its flat, squared-off façade. The “Four Sisters’ Houses” are close to the street and extremely close to one another. Although the houses take up most of the lots, there was room in the rear for a shared barn and garden. The interiors of all four houses were fairly identical with a straight-run staircase in the entrance which runs the depth of the house. Double parlors are on the right hand side of the entrance hallway with a dining room at the rear. The ceilings are twelve-foot high with wide old woodwork framing doors and windows. The floors are wide heart pine with coal-burning fireplaces with an assortment of interesting mantels. The rear of the house slopes downward creating three levels. The lower level originally houses services areas—laundry, scullery, domestic housing, etc. In 420 South Perry, visitors to the Renovators’ event can see Gisi’s craftsmanship on the main floor which is nearing completion but there is still a lot to imagine in the unfinished rear rooms. Upstairs, the four bedrooms remain very original and untouched so you can see early closets, original wallpaper and paint colors and envision what these rooms could be used for. The Landmarks Foundation Renovator’s open house will be held on Thursday afternoon, March 29, from 5:30 until 7:00 and is open to Landmarks Foundation members. Memberships are available online at www.landmarksfoundation.com or on the porch that evening. Historian Jeff Benton, author of A Sense Of Place: Montgomery’s Architectural Heritage, will be on hand to share the rich history of Alma’s house as well as that of her sisters. Come and hear about the renovation efforts, get inspired and support historic preservation in Montgomery. For more information, call 334-240-4500.